News | Law Offices of Martin & Hipple, P.L.L.C. At Martin & Hipple, we maintain strict values of client confidentiality. This means that, while very proud of our successes, we are not always able to share good news with others. We hope to use this page to share news with the public while still maintaining the confidentiality and anonymity of our clients, except in cases where our clients specifically authorize us to share identifying information. Of course, each case’s outcome rests on its particular facts so past results shared in our advertising below don’t guarantee identical or similar future results. To the plaintiff, the settlement is no small sum: $275,000 paid by New Hampshire taxpayers after Ashley Rossiter brought a wrongful termination lawsuit against the state’s Division for Children, Youth and Families. But Rossiter says the message is more important than the money. In October 2016, Rossiter was fired from her position with the child services agency after a string of poor performance reviews that she says were retaliatory. An outspoken critic of agency leadership, Rossiter says she often locked horns with her superiors over constraints imposed on caseworkers. The suit she filed in January 2017 has yielded Rossiter a comfortable exit package. More significantly, she says, it sent a message to an agency she says still needs a culture change. DCYF has seen a harried few years, and few have experienced its hardships as closely as Rossiter. Years before a comprehensive audit exposed a litany of shortcomings in 2016, Rossiter was just starting out at the agency. It was a troubling environment from the start, she said in an interview. Under staffed and overworked, the employees faced a daily onslaught of difficult choices that held back their work, Rossiter said. Workers were constrained to strict eight-hour workdays – overtime was almost never given – yet supervisors still demanded a high output of case resolutions, according to Rossiter. That meant a constant search for balance between checking in on children and families and working to finish paperwork to close out cases. Management heavily favored the latter, Rossiter said. Employees were encouraged to take the quickest route possible, she added. Any time a child was placed in a foster home, for instance, DCYF caseworkers were pushed to move on to other cases, placing the child’s future in the hands of foster parents moving forward, she said. That’s “a great way to burn out foster parents,” she said. She tried to bring them to the attention of management in 2013, gradually working her way up the chain of command with her concerns, she said. But none were addressed, and her complaints began to take a toll on her career, she claims. Despite hurting her arm in an ATV accident, she was not given work extensions or provided technology to assist with typing – despite it being available to others, she says. She was written up consistently for staying over her hours, and eventually fired over it, she says. The claims would form the backbone of her discrimination lawsuit. A spokesman for the Department of Health and Human Services, which oversees DCYF, declined to comment on the charges, referring questions on the lawsuit to the attorney general’s office. In an interview, Assistant Attorney General Ann Edwards stressed that the settlement did not include an admission of wrongdoing by the state. The state chose to settle in order to head off a loss of productivity that a trial would inflict on the agency – not because it was at fault, Edwards said. Still, Rossiter stands by her claims of wrongful termination. And she says her experience shines a light on a continuing problem for the agency. While Gov. Chris Sununu and Commissioner Jeffrey Meyers have taken action and replaced top leadership officials at the agency – including, notably, its director Lorraine Bartlett in 2017 – those in “middle management” still maintain power. Those employees, she says, are the ones with the longest tenure, and the ones most responsible for the conditions. Those in the field meeting the families firsthand, meanwhile, have the highest turnover year to year. That contrast is telling, Rossiter argues. In recent years, the Legislature and governor have rushed to make improvements to the agency as it struggles to find its footing – adding dozens of caseworker and management positions in an attempt to clear away a persistent backlog. The agency is now helmed by Joe Ribsam, a former top official credited with turning around New Jersey’s child services agency. Meanwhile, a string of recent taxpayer-funded settlements and a recently released federal report critical of the agency have led to calls by Democratic candidates for state office for an increase in funding and positions in the next budget. Rossiter, who had a meeting with Ribsam as part of her settlement agreement, said his “heart is in the right place.” But she said the agency has a long way to go. And money is only a part of the problem, she said. In a win for Attorney Martin’s client and for New Hampshire homeowners throughout New Hampshire, the United States District Court for the District of New Hampshire declared, for the first time, that a spouse does not lose her homestead interest upon divorce. The first of its kind in New Hampshire, the Federal Court’s ruling unequivocally holds that a divorce does not extinguish a homeowner’s homestead right, and that the homeowner is therefore entitled to be paid $120,000 to buy out this right before taking her home. “Dear Attorney Seth Hipple, I would like to thank you for representing me. You listened to me and took the time to hear my concerns. This was a very difficult time for me but much good has come out of a very bad situation, with your help. Your ability to negotiate with the prosecutor to have one of the charges dismissed, to have my fine dropped, and to have my sentence lessened to just one year of good behavior is, without a doubt, remarkable. I would highly recommend you to anyone who needs an attorney’s help. You treated me with dignity and respect. Again, thank you.” ~ Claire W.
As covered in the Concord Monitor here, the Weare Police Department issued a letter of apology as part of a settlement of a suit filed by Martin & Hipple on behalf of our client, William Alleman. The Department also agreed to pay Mr. Alleman $35,000 to avoid a trial on Mr. Alleman’s suit, arising out of his arrest in 2011 merely for safely recording his motor vehicle stop with his cell phone. In the apology, the Department acknowledged in writing for the first time that it never should have arrested and prosecuted Mr. Alleman for recording police activity. The First Circuit Court of Appeals has upheld the constitutional right to record police traffic stops. In doing so, the Court allowed a lawsuit against several New Hampshire police officers to proceed. The suit is brought by Carla Gericke, who has been a client of Martin & Hipple since she was first arrested in 2010. You can view the Union Leader’s coverage of this decision here. You can view the opinion itself here. The Monadnock Ledger-Transcript covers the settlement from the Town of Dublin, NH, our client’s former employer. Read the full story here. “Not too long ago I was involved in a serious car accident through no fault of my own. Negotiating through the legal process was overbearing, so I turned to Martin & Hipple to negotiate my legal path to recovery. Although nothing can truly give me back all that I lost, Martin & Hipple made sure that those responsible paid and that all insurance claims were paid in full. Ultimately through their compassion, perseverance, and commitment, Martin & Hipple recovered a substantial settlement award as compensation for my medical bills and pain and suffering. Thank you to Attorney Stephen Martin for his expertise and professionalism.” — L.J. A Federal District Court judge refused to dismiss a Martin & Hipple client’s claim against the Weare Police Department. Attorney Stephen Martin represents Carla Gericke, who was arrested and charged with felony wiretapping when she openly attempted to record a traffic stop. Click here to read the full story. The New Hampshire Bar Association’s Leadership Academy aims to “identify, inspire and train emerging leaders of the legal profession in New Hampshire.” Martin & Hipple is proud to announce that Attorney Seth Hipple has been selected to participate in the program along with ten other attorneys. View the full class and find more information here. 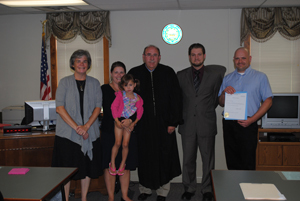 Attorney Hipple posing with his clients, their newest family addition, the guardian ad litem, and the judge after the court granted the adoption petition. When my sister left my niece on my doorstep without any provision for her care, I undertook the task of parenting her as my own child. But when I and my husband wanted to adopt our niece, we could not without my sister giving up her parental rights, something she was not willing to do. To make matters even more complicated, our niece’s biological father lived in South America and spoke no English. We needed help and that help came in the form of Attorney Hipple. He listened to our needs carefully and compassionately. He was straight with us about what we needed to do to optimize our chances of success and kept in contact with us at every step of the process. After a very long and grueling court process, I am happy to say that we have adopted our niece; the law now recognizes her special place in our family as our daughter, as we have always viewed her. We could not have accomplished this without the help of Attorney Hipple and his patient, detail-oriented work on our behalf. We are very happy with Seth Hipple and The Law Offices of Martin Hipple. I would use Seth again in the future and would highly recommend him to my closest friends and family. When I was charged with a crime I didn’t commit, I was scared and didn’t know what to do. A friend suggested I call Attorney Seth Hipple. Attorney Hipple got all of the police’s evidence and reviewed it, and went step by step with me to get all the information he would need to help him put together the case. After speaking with Attorney Hipple, the prosecutor dropped the charges. We didn’t even have to go to trial! I would definitely recommend Attorney Hipple to friends and family. He took the time to make sure I understood what each step of the process would have been, and that gave me the peace of mind and confidence I really needed during the court process. I was referred to the Law Offices of Martin & Hipple by the NH Bar Association. I worked with Attorney Stephen Martin to file personal bankruptcy as a result of a tragic event in my life. From the very first phone call, and continuing throughout the entire process, Steve was exceptionally prompt in responding to all communications. He was also professional, patient, attentive, and fully knowledgeable of the process and the law. Because of his close and careful understanding of the legalities that would give an ordinary consumer migraines, he made sure that no obstacles arose, and that the process was as swift and painless as anything this difficult could be. His billing was completely fair and transparent. He did everything he agreed to do, and he made sure that not only he, but also I, made no mistakes in the paperwork required for filing. For him, I was not just another client, and this was not just another filing. He actually treated the work as a privilege. And even a full year later when I called with a related problem, he took time out from his day and made a phone call on my behalf, which immediately solved the problem. I have and will continue to recommend without reservation, the Law Offices of Martin and Hipple to others. Attorney Martin, Just wanted to . . . thank you for handling my employment suit. Although trying at times, you persevered through the witness statements, paperwork, and numerous phone calls to satisfy me. WE DID IT!!! I and my wife contacted Seth Hipple at The Law Offices of Martin Hipple at the 11th hour of our case. We had moved out of state and various personal matters kept us from addressing legal claims made against us. Because of this, the court had ruled for the other side and ordered us to pay damages. With little or no hope left, we contacted Seth. He was responsive and quick in replying to us and immediately filed paperwork on our behalf to request that the court reconsider the judgment against us. He reviewed our case thoroughly, and filed additional motions that forced the other side back to the negotiating table. We ended up getting a settlement check paid to us – an amazing feat considering our starting point was having already lost the case. Excellent work by Seth Hipple and The Law Offices of Martin Hipple. I would use Seth again in the future and would highly recommend Martin & Hipple’s services. When Martin & Hipple client William Alleman was pulled over in the town of Weare, NH, he recorded the interaction with the officer with his cell phone. For this, Mr. Alleman was charged with wiretapping, a felony carrying up to seven years in prison. Attorney Seth Hipple filed a Motion to Dismiss arguing, among other things, that the right to record how public servants perform their public duties is enshrined in the First Amendment to the US Constitution. The Court agreed, dismissing the charges against Mr. Alleman, marking the first time in history that a New Hampshire Court affirmed what other Courts across the country had already said: recording public officials performing public duties in public is not a crime; it is a right protected by the Constitution. See coverage from the Union Leader here. Coverage by The New American is available here (PDF here). Attorney Seth Hipple quoted as source on state wiretapping law in the New Hampshire Union Leader. Read More. Independent journalist David Ridley set out to interview political leaders at an event with Vice President Joe Biden. Instead, he ended the day in handcuffs charged with criminal trespass. When the Secret Service decided that they preferred the mainstream reporters to Mr. Ridley’s independent style, the manager of the Radisson in Nashua walked outside and told Mr. Ridley to leave. The manager did not identify himself, even after Mr. Ridley requested he do so. To be on the safe side, Mr. Ridley began to leave the property, walking backwards as his training as a videographer dictates so that he could continue to get a shot of the officers manning the vice president’s security detail. However, this was not enough. As Mr. Ridley walked to his vehicle, two Nashua Police officers followed him and demanded he give his name and date of birth. Mr. Ridley refused, as there is no obligation to identify oneself in New Hampshire. Following this refusal, the officers arrested Mr. Ridley and charged him with criminal trespass, only a few paces away from his parked vehicle. Attorney Seth Hipple represented Mr. Ridley at a bench trial. At trial, Attorney Hipple was able to prove through cross examination that Mr. Ridley had made significant progress towards his vehicle and was attempting to leave even as he was arrested. He was acquitted of criminal trespass following trial. Video of Attorney Hipple’s comments following trial can be found here. A fuller write up of the trial can be found here. Martin & Hipple file Federal Lawsuit for Constitutional Violations. Read More. Judge Orders Police to Return Unconstitutionally Seized Property to Martin & Hipple Client. Read More. Tavern Owner and Martin & Hipple client George Hodgdon acquitted on all charges following trial. A Weare bar owner was found not guilty of all charges Tuesday after being accused of misleading a police investigation into the assault of a Deering selectman. Read More. Union Leader covers Martin & Hipple standing up for their client. The owner of Palmer’s Tavern filed a complaint Friday against the Weare Police Department, alleging on-duty, uniformed officers asked to place a political sign for incumbent Police Chief Gregory Begin on his property, violating state and federal campaign laws. Read More. Martin & Hipple’s fight for government accountability once again covered in the Union Leader. Appearing on the Union Leader is an article entitled “Weare police charge man for recording traffic stop.” You can view a copy of the article here. Appearing on page A4 of the Union Leader is an article entitled “Activists Claim Police Won’t Give Back Recording Devices.” You can view a copy of the article here. A DUI conviction carries serious criminal penalties. In addition to the stigma of a criminal record and the cost of undergoing alcohol awareness programs, a person convicted of DUI can have his or her license revoked for up to two years for a first offense. The minimum license suspension under the statute for a first offense is 9 months. That is why our client was very happy when we were able to get a DUI charge dropped in exchange for a short stint of community service and a minor traffic violation. Our client did not even have to plead guilty. This positive outcome was due to our investigation into the incident, revealing problems with the way the police tested our client’s blood. Due to uncertainty of winning at trial because of our investigative work, the prosecutor offered this favorable deal. To settle the case, the State offered Ms. Bleish a mere $250 fine and a violation-level offense in exchange for a guilty plea. Standing on principle, she refused this offer. Attorney Seth J. Hipple represented Ms. Bleish at trial, and, upon cross examining the officers, was able to prove that Ms. Bleish was not the cause of the substantial interference, if any, and further that she was not given an opportunity to leave after being ordered to do so. The Court took the case under advisement and issued an order of not guilty two days later. Martin & Hipple are proud to have represented Ms. Bleish in this important free speech case. Martin & Hipple enjoy winning at trial, but an attorney’s job starts long before trial. Our firm works to resolve cases before they go to trial. That’s why when a woman came forward to us telling us she was charged with a felony for protecting her neighbors, Martin & Hipple didn’t just rely on the police reports. We contacted her neighbors. We encouraged our client to reject a plea offer of a Class B felony conviction, even though it didn’t carry jail time. We met and spoke to all witnesses to the events and prepared affidavits, communicating with the prosecutor every step of the way. When Martin & Hipple were done, it was clear to the prosecutor that our client did not deserve to be charged. While some believe that prosecutors simply want convictions at any cost, that was not the case in this instance. The prosecutor informed us on July 9, 2010 that he was dropping all charges in the interests of justice. It is an unfortunate fact that police departments sometimes charge individuals with “wiretapping” for simply holding a camera in a public place and pointing it at the police who are performing their public duties. One such individual came to our firm for help. In the weeks leading up to the court hearings, the police department continued to add new charges in an attempt to cow our client into pleading to a lesser charge. Martin & Hipple advised our client to hold firm. After arriving at the probable cause hearing prepared to argue zealously on behalf of our client, the prosecution informed us they were dropping all charges. Video of the aftermath can be found here. Martin & Hipple are now pursuing all audio and video recording of the event in order to ensure that our client’s rights are protected.